The Progressive Dynamics 9200 Series INTELI-POWER converters are UL listed for the US and Canada. They provide safe, reliable, filtered DC power to all Recreational Vehicle 12-Volt lighting and appliance circuits. 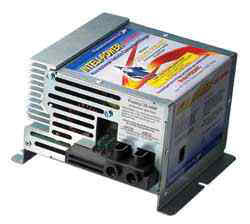 The Inteli-Power converter also safely recharges and maintains the RV battery and has a two-year limited warranty. (Boost, Normal, Storage, or Desulfation) to properly re-charge or maintain the battery. Progressive Dynamics 9200 Series Electronic Power Converters have several features that differ from other electronic power converters presently marketed to the RV industry. Reliability data over the past eight years on over 400,000 units in the field have proven that these design features increase our reliability and provide the following additional customer benefits. 1. ELECTRONIC CURRENT LIMITING – This safety feature will rapidly reduce the output current in case of an electrical short or overload condition. This rapid shutdown like the circuit breaker in your house prevents possible RV wiring and converter damage. The converter automatically returns to normal operation when the short or overload is corrected. 2. VARIABLE SPEED INTELLIGENT COOLING FAN – Solid state temperature sensing and control system automatically monitors converter temperature and activates the fan at speed required. Very slow, quiet speeds are used when demand is low, such as during sleeping hours. Some competitive converters use Electro-mechanical devices to provide temperature sensing and fan control. Electro-mechanical sensors are more subject to failure and may stick in the closed mode causing the fan to operate all the time, resulting in an irritating noise. They can also fail to close during high temperature conditions and prevent the fan from operating. This failure may cause over heating and possible converter failure. 3. AUTOMATIC THERMAL SHUTDOWN – This safety feature will shut the converter down in the unlikely event of a fan failure and prevent damage to the converter. This safety feature will also activate if the area where the converter is mounted is too small, has inadequate ventilation, or is accidentally covered by the customer. This Automatic Thermal Shutdown turns the converter off when unit temperature exceeds 150 degrees F. Please refer to the installation instructions for information regarding spacing and ventilation requirements. 4. LOW LINE VOLTAGE PROTECTION – The Progressive Dynamics 9200 Series Converters will operate at low AC line voltages without damage. This feature is especially important in RV campgrounds where AC line voltage can be as low as 90 volts. Low AC line voltages may damage competitive converters. Low Line Voltage Protection will automatically shut converter down if input voltage is insufficient. This also protects your 12-volt appliances from damaging low voltage irregularities. The converter will automatically return to normal operation when adequate line voltage is available. 5. HIGH VOLTAGE PROTECTION – All converters incorporate our patented High Voltage Shutdown circuitry. This feature automatically shuts the converter down to protect sensitive electronics in the event of high voltage transients on the AC power line, or if the RV generator regulator should momentarily fail. The converter will automatically return to normal operation when the high voltage transient is corrected. 6. REVERSE BATTERY PROTECTION – Our patented Reverse Battery circuitry prevents converter damage and unnecessary warranty calls in the event the customer or dealer accidentally connects the battery in reverse. Simple replacement of the fuse(s) located on the front of the converter restores the unit to normal operation. Some competitive converters can be damaged and require replacement if the battery leads are accidentally reversed. 7. BUILT-IN ACCESSORY PORT – All PD9200 Series Power Converters incorporate an accessory port for the optional Converter Status Remote Pendant which is used to monitor the Charge Wizard operating modes. Weight 4.5 LBS. 5.8 LBS. 5.8 LBS. 7.5 LBS. * Fan speed automatically controlled according to converter temperature. ** Allows the customer to easily install the optional Pendant to monitor the built-in Charge Wizard and also allows manual mode selection.